Our Cruise will take you on a 21-day journey through South America aboard the Azamara Pursuit Cruise Ship, starting from Callao, Peru. You will visit incredible places like Lima, Pisco, Antofagasta, La Serena, Valparaiso, Puerto Montt, Puerto Chacabuco, Punta Arenas, the Beagle Channel, Ushuaia, Puerto Argentino (Malvinas Islands), Montevideo, Punta del Este and Buenos Aires. * Selected cruise ship, chosen category and full board. * Water, soft drinks, special coffees and teas, a selection of sparkling wines, beers and wines for lunches and dinners. * Transfer service to/from the port (subject to availability). * English butler for the Club Suite cabins. The minimum age for travel is 6 months. The age of majority is 21 years. * Passengers must be in possession of the documentation (passport, visa, identity card) required by the laws of the countries to/from/through which they are going to travel. * Once the reservation has been confirmed, the modification or cancellation will entail costs for the shipping company (to be consulted). * All itineraries are subject to change without notice. Confirm your itinerary before you buy the cruise. Sail from Lima, the "City of Kings," to beautiful Pisco, Peru. Be sure to sample the national beverage of the same name before making your way to an overnight stay in Antofagasta, Chile. There will be a lot of time to explore the scenic salt flats, lagoons, and sprawling desert landscapes. Next, the port of Coquimbo leads to La Serena, Chile, between the Atacama Desert and the country's fertile central valley—a prime wine-tasting region. The historic port city of Valparaiso, a UNESCO World Heritage Site, offers some of the best in Chilean food, art, and culture waiting to be discovered. Puerto Montt—also known as the gateway to the Andes—is next, followed by a visit to Puerto Chacabuco, then on to an overnight in Punta Arenas, where the Strait of Magellan merges the Atlantic and Pacific. As you depart down the coast for the historic Beagle Channel and Avenue of the Glaciers, watch in amazement in every direction for some of the most spectacular scenery on earth. A stop in Ushuaia, Argentina follows before it’s on to Puerto Argentino, the capital of the Malvinas Islands. 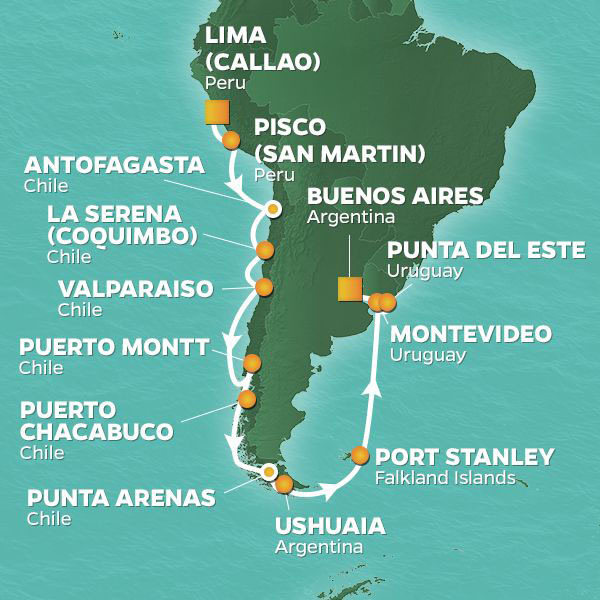 Cruise north for two days along Argentina’s coast to Montevideo, Uruguay. Then travel to Punta del Este for a day. The epic 21-day voyage concludes with a day in Buenos Aires, Argentina, the country’s cosmopolitan capital. If you are looking for what to do in Lima, you should consider booking the tour . It´ll be an experience you won´t forget! if you are traveling to Lima you shouldn´t miss the tour . It is a unique experience!